Agriculture is a very vast field and lots of research is going on in this field. Crop Monitoring System (CMS) is one of the largest areas of agriculture research .Many applications are developed for different areas of agriculture like crop protection, pest control, seeding, weather monitoring etc. Normally, burning of crops like rice, wheat, maize, sugarcane etc in agriculture field leads to great loss of farmers in terms of finance, life and food. Burning of crops can happen due to several reasons like spark in power cables which are going through field, thundering of light, accidently via any fire source etc. If proper devices are installed in fields, lots of loss can be reduced by taking proper actions in advance. This device is based on flame sensor and is developed especially for crop monitoring in agriculture fields, farms, wet lands, forests etc.GSM technology is use to send SMS alert to user on mobile whenever there is fire broken out in field. It will also generate buzzer sound to alarm nearby people to take proper action to diminish fire. With continuous status of crops in field, appropriate arrangements can be made in advance to avoid any loss/emergency. This model has LCD display to display flame intensity. This device is quite economical with most economical cost. Apart from that, this device can be used in industries, hospitals, homes, sites etc to detect fire. This device is tested in various distance levels and displays the result for flame level. This device is able to detect flame, fire for more than 10 feet and send SMS to field owner through GSM module. It generates alarm with flame intensity level. This device can be installed in agriculture field with proper support and shield to detect fire. This device is using Embedded Arduino Uno Technology. 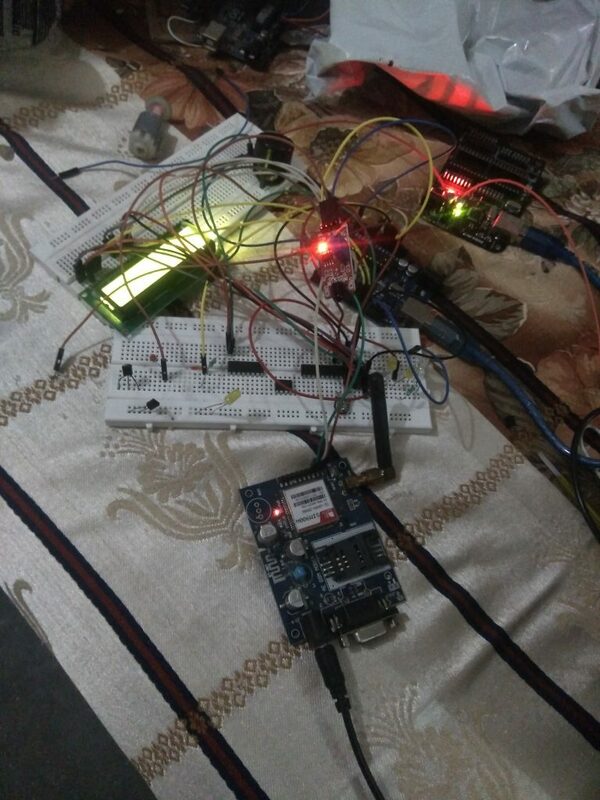 It comprises LCD (16×2)(JHD162A), Arduino UNO,PIEZO Buzzer, GSM based SIM900A module,rheostat(10k),battery 9v,LED. Whenever there is fire broken out in crops in agriculture field, this system detects fire and generate SMS alert within seconds to field owner. It also has sound alarm facility and display system. This system can detect fire more than 10 feet .You can see flame level on serial monitor and LCD. Once you press “s” on serial monitor, this system starts recording flame or intensity level. The values are displayed on LCD. Whenever value goes below threshold, it starts generating SMS alert and buzzer alarm with led visual display. You can take candle in front of flame sensor and monitor the detection distance with flame value. The sensitivity can be adjusted via potentiometer. Flame Detection Sensor Module is quite sensitive to the flame or light. It is used as a flame alarm and detects a flame or a light. Detection angle can be around 30-50. It operates at 5 V.
The JHD162A LCD module has 16 pins. The Arduino Uno R3 is a microcontroller technology based on the ATmega328 series based. 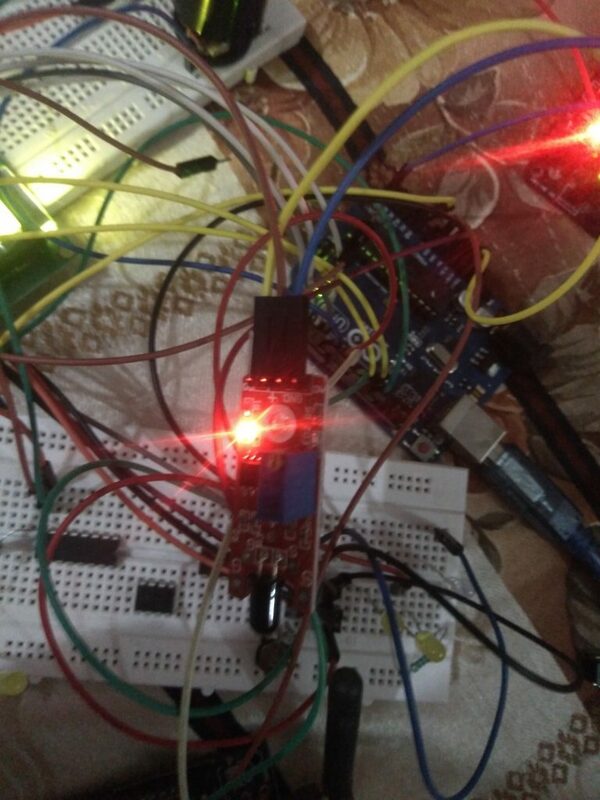 It contains 14 digital input/output pins (of which 6 can be used as PWM outputs), 6 analog inputs, a 16 MHz crystal oscillator, a USB connection, a power jack, an ICSP header, and a reset button. This module works on frequencies 900-1800 MHz. It is coming with RS232 interface, which allows you to connect PC and microcontroller with RS232 Chip. The baud rate can be set in range of 9600-115200 command. It contains internal TCP/IP stack to enable you to connect with internet via GPRS. It is suitable for SMS, call, internet connectivity applications. A potentiometer is a three-terminal resistor with a rotating contact that makes a adjustable voltage divider. If only two terminals are utilized, one end and the wiper, it behaves like a variable resistor or rheostat. 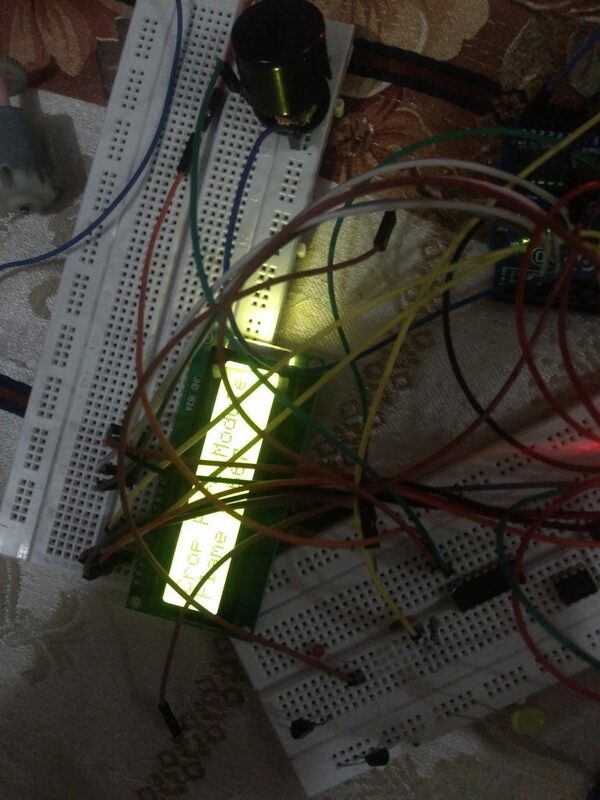 Programming of project is done on arduino 1.8.6 tool. Sensor analog output signal is taken on A5 pin of arduino and printing the flame to the serial monitor in PC and on LCD in digital form. Analog output pin A0 of flame sensor is connected to A5 pin of arduino and other 2 pins to 5V and ground. Make connections as per circuit diagram. 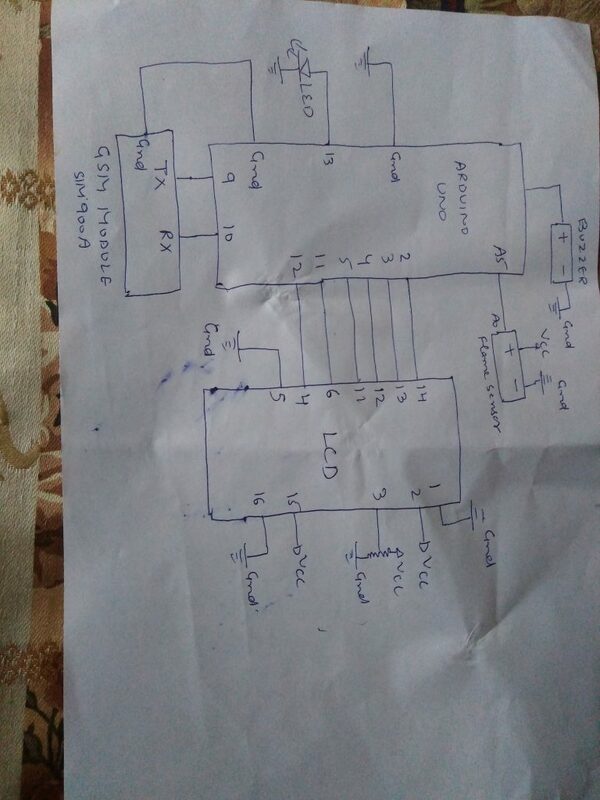 Give voltage from board. Record the flame level on LCD and serial monitor. Whenever there is a flame and fire in environment in fiels ,it will update the status of flame level on LCD with SMS and buzzer alert. Circuit is made on breadboard with jump wires. It is tested on various situations and works good.